Always be prepared with the JACKYLED adapter for when your light bulb needs a replacement and you do not have a proper bulb. 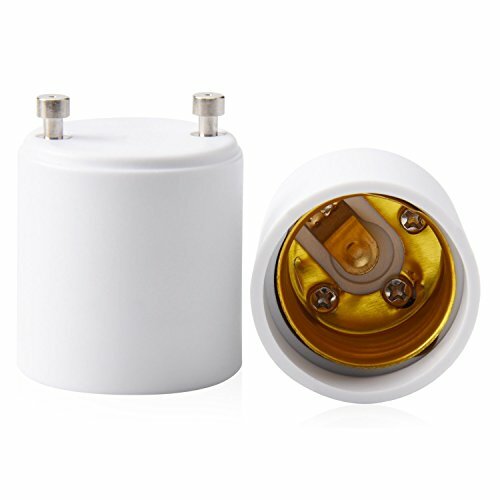 JACKYLED GU24 to E26 / E27 Adapter provides the simplest solution to your home light adapter problems. Just twist one of these adapters into your GU24 pin-based fixture, and then you can use any 26/E27 light bulb as needed. 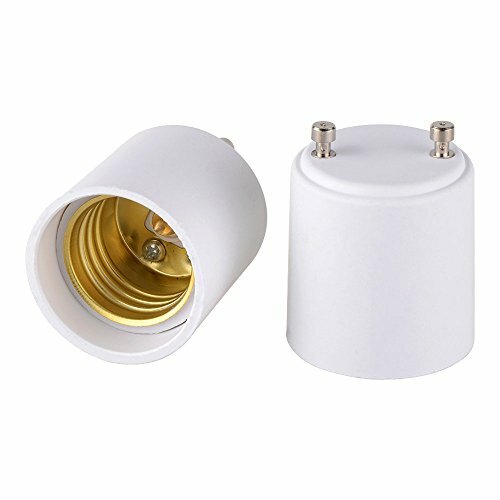 GU24 to E26 / E27 standard base screw in light bulb socket adapter, allows you to use a screw in light bulb in a GU24 Socket. Simple to use and allows you to keep using conventional screw in light bulbs instead of the GU24 based bulbs. Ideal for lights with E26 / E27 sockets that need to be converted to a GU24 base. Weight: 24g/0.85 OZ Caution: to avoid risk of fire make sure your bulbs do not exceed the recommended wattage indicated on your light fixture. When installing the light bulb, gently screw it into the GU24 to E26/E27 adapter. Attention: JACKYLED products are sold and shipped by Jackyled Direct. If you purchase items from another seller without our logo JACKYLED, please request a refund as it is likely a counterfeit JACKYLED product. JACKYLED is the only Authorized Dealer of Jackyled Direct products. PARAMETER: JACKYLED GU24 adapter can be used with the maximum wattage of 150W and the maximum voltage of 250V. 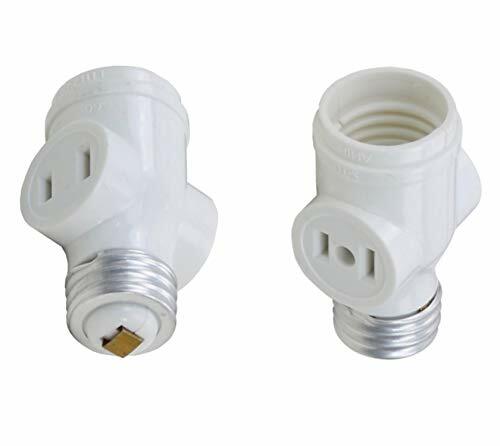 SAFETY: JACKYLED GU24 adapter is made from PBT fireproof material with a fire resistance rating of UL94 V-0. It is 200-degree heat resistant with no flame hazard. LENGTH: JACKYLED GU24 socket converter increases the length by 1. 5 to 2. 5 inches depending on the depth of the base you are screwing into. 100% SATISFACTION : We strive to provide each customer with the highest standard of customer service to ensure you have a pleasant shopping experience. If you have any issues, inquiries or need assistance, please feel free to contact us directly. 30-day money-back for any reason, 12-month for quality-related issues. Size:2 packAlways be prepared with the JACKYLED adapter for when your light bulb needs a replacement and you do not have a proper bulb.JACKYLED GU24 to E26 / E27 Adapter provides the simplest solution to your home light adapter problems. 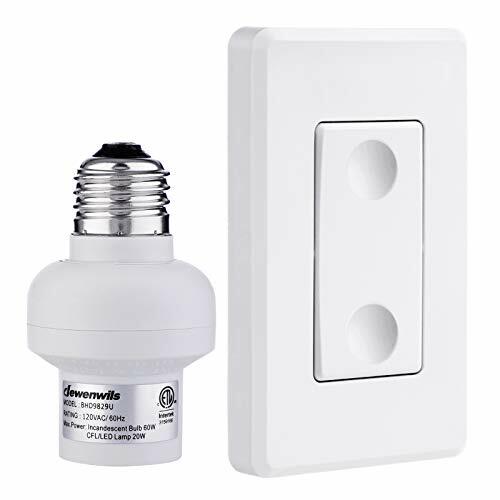 Just twist one of these adapters into your GU24 pin-based fixture, and then you can use any 26/E27 light bulb as needed.GU24 to E26 / E27 standard base screw in light bulb socket adapter, allows you to use a screw in light bulb in a GU24 Socket.Simple to use and allows you to keep using conventional screw in light bulbs instead of the GU24 based bulbs.Ideal for lights with E26 / E27 sockets that need to be converted to a GU24 base.Specifications:Type: GU24 to E26 E27Dimension: 42mmx35mm (Approximate)Color: whiteWeight: 24g/0.85 OZCaution: to avoid risk of fire make sure your bulbs do not exceed the recommended wattage indicated on your light fixture.When installing the light bulb, gently screw it into the GU24 to E26/E27 adapter.Attention: JACKYLED products are sold and shipped by Jackyled Direct. If you purchase items from another seller without our logo JACKYLED, please request a refund as it is likely a counterfeit JACKYLED product. JACKYLED is the only Authorized Dealer of Jackyled Direct products. LENGTH: JACKYLED GU24 socket converter increases the length by 1.5 to 2.5 inches depending on the depth of the base you are screwing into. 100% SATISFACTION GUARANTEE: We strive to provide each customer with the highest standard of customer service to ensure you have a pleasant shopping experience. If you have any issues, inquiries or need assistance, please feel free to contact us directly. 30-day money-back guarantee for any reason, 12-month warranty for quality-related issues. I recently purchased a wall mount lamp for the outside of my house and when I got home, I noticed that the socket base is different from the usual screw base. The lamp I have uses the standard E26 base. While the socket base is a GU24 base with two metal rods sticking out. Is there an adapter out there that can convert the GU24 base to a standard E26 base so I can continue to use my existing bulbs? Of course, you could use Onite GU24 to E26/E27 Adapter to convert you base easily. 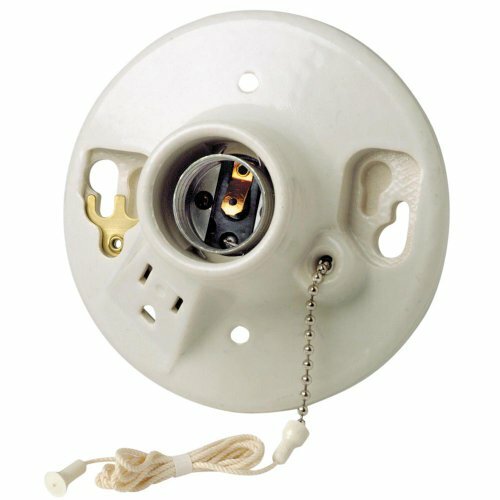 My house is outfitted with some pin-based fixtures and the bi-pin bulbs have to be replaced quite often, they are hard to find, high priced and limited styles available. 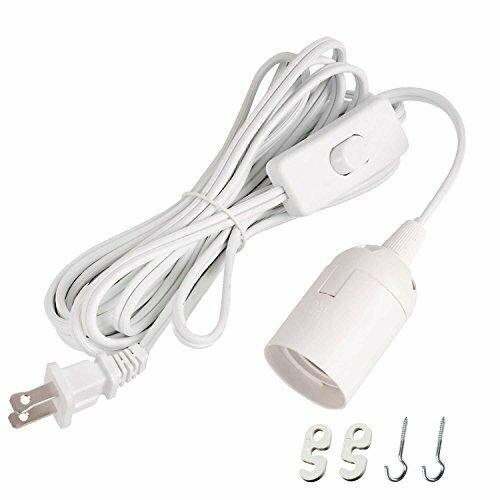 Solution: Simply twist one of these adapters from HouStuff into your GU24 pin-based fixture, and you are now free to use any standard screw-in bulb. Caution: To avoid risk of fire make sure your bulbs do not exceed the recommended wattage indicated on your light fixture. Fits for all standard bulbs. Easy to use, just twist into existing socket. Easy to use, just twist into existing socket. 2 Years Warranty! 100% Brand new high quality. 30 days return policy or full 100% Money back refund or exchange. 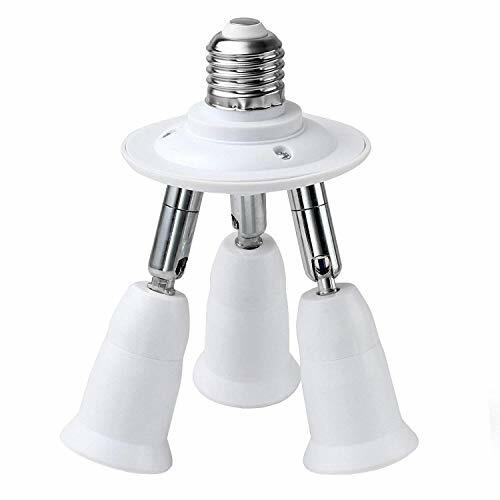 Specifications: Type: Bulb Base Adapter (no bulds included) Style: 3 in 1 Base type: Standard E27 base,can also be used for E26 Features: This product is mainly used in photography 3 in 1 studio E27 lamp socket splitter adapter for studio daylight bulbs Allows 3 bulbs installed in one single socket for bright illumination,360 Degrees Adjustable , 180 Degree Bending,you can adjust it to the perfect position This product idea for more lights for photo or video, if you want to upgrade your single socket lights, convert a single bulb light to 4 bulbs light, this is the best choice It is E27 base, same fit as regular household bulb socket Application 1. For the bedroom, living room, conference room, kitchen, living room, hall, telephone booths, workshops and exhibitions, etc. 2. Architectural lighting, the communication lighting ,the city lighting,in the families and in the Public decorative lighting. 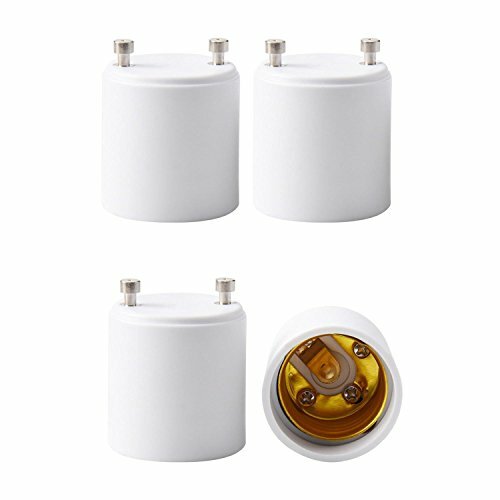 MAX WATTAGE: Max wattage per socket of the splitter is 60W, 90-240V working voltage, suitable for any E26 E27 standard LED, incandescent and CFL (Energy Efficient) light bulbs. SAFETY DESIGNED: This 3 in 1 adapters are CE certified. Inflaming retarding PBT fireproof material and aluminium alloy, the heat resistant is up to 200 degree. 100% safe from electric flaming, no fire hazard. 360 DEGREE ROTATABLE: Each socket has 360 rotating degree design, and the bending degree is 180. You can adjust the angle of the socket at your will. WIDE APPLICATON: Ideal for a full house application, also a good test for this premium quality. For bedroom, living room, kitchen, hallway, conference room, office, workshops and exhibitions, etc. Specifications: Type: Bulb Base Adapter (no bulds included) Style: 5 in 1 Base type: Standard E27 base,can also be used for E26 Features: This product is mainly used in photography 5 in 1 studio E27 lamp socket splitter adapter for studio daylight bulbs Allows 5 bulbs installed in one single socket for bright illumination,360 Degrees Adjustable , 180 Degree Bending,you can adjust it to the perfect position This product idea for more lights for photo or video, if you want to upgrade your single socket lights, convert a single bulb light to 4 bulbs light, this is the best choice It is E27 base, same fit as regular household bulb socket Application 1. For the bedroom, living room, conference room, kitchen, living room, hall, telephone booths, workshops and exhibitions, etc. 2. Architectural lighting, the communication lighting ,the city lighting,in the families and in the Public decorative lighting. MAX WATTAGE: Max wattage per socket of the splitter is 60W, 90-240V working voltage, suitable for any E26 E27 standard LED, incandescent and CFL (Energy Efficient) light bulbs.you can use any type of bulbs you need. 360 DEGREE ROTATABLE: Each socket has 360 rotating degree design, and the bending degree is 180. You can adjust the angle of the socket at your will.Easy to increased brightness with this 5 in 1 E26 E27 light splitter. SAFETY DESIGNED: This 5 in 1 adapter splitter is CE certified. Inflaming retarding PBT fireproof material and aluminium alloy, the heat resistant is up to 200 degree. 100% safe from electric flaming, no fire hazard. WIDE APPLICATON: Ideal for any occasion.For bedroom, living room, kitchen, hallway, conference room, office and exhibitions, etc. 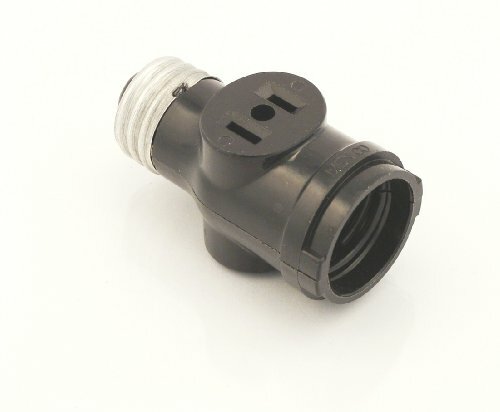 PBT FIREPROOF MATERIAL: Made of high-quality thermoplastic polymer (PBT) and copper, this adapter comes in a solid construction, high temperature resistant, corrosion resistant and anti-burning, safe from electric flaming. No fire hazard. E12 TO E26: Easy to transform any screw-in E26 E27 light bulb into E12 base. 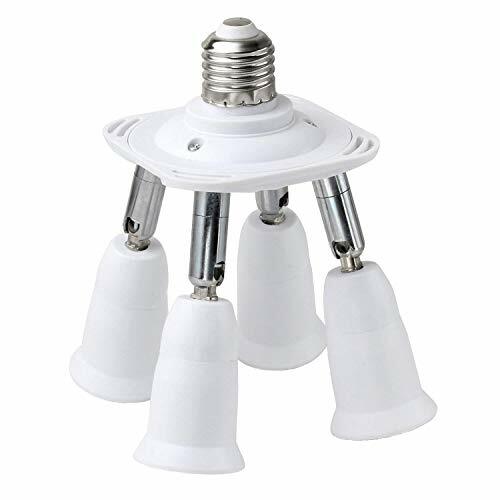 Ideal for ceiling fans or lights with candelabra sockets that need to be converted to a standard medium base. WIDE APPLICATON: Ideal for a full house lighting. For garage, bedroom, living room, kitchen, hallway, conference room, office, workshops and exhibitions, etc. SATISFACTION GUARANTEE: 5-pack. 1 year warranty. 100% satisfaction guaranteed. 60 days no reason to exchange or refund. JACKYLED Products are sold and shipped by Jackyled Direct. If you purchase a product from another seller, please request a refund as it is a counterfeit. JACKYLED is the only Authorized Dealer of Jackyled Direct products. METERIAL: Construction is no frills, but solid, made of metal and bakelite. The heat resistant is up to 200 degree. TECHNICAL SIDE: The typical American 110V incandescent bulb has an Edison E26 base (often labeled Standard Size in America) and thus screws into an E26 socket, to use these so you can use normal bulbs. UL Listed, insulation Flame retardant Heat resistant, durable, anti-burning and long-lasting. MAX WATTAGE: 300 Watts max wattage, Voltage is 110V, allows you to use high wattage light bulb. The adapter will not convert the voltage. If you have 110V, it will stay 110V. Likewise, 220V will not change. This adapter is for physical dimensions only. EASY TO INSTALL: The bulbs fit into the adapters very easily and each one of ours fits securely. Doing this enabled us to replace the old CFL's we had with something that is non-toxic and uses less electricity. SATISFACTION GUARANTEED: 2-Pack. 100% satisfaction guaranteed. 60 days changing or refunding without reasons. Onite always stand back for its products, any issue of the product please don't hesitate to contact us. Specifications: Type: Bulb Base Adapter (no bulds included) Style: 4 in 1 Base type: Standard E27 base,can also be used for E26 Features: This product is mainly used in photography 4 in 1 studio E27 lamp socket splitter adapter for studio daylight bulbs Allows 4 bulbs installed in one single socket for bright illumination,360 Degrees Adjustable , 180 Degree Bending,you can adjust it to the perfect position This product idea for more lights for photo or video, if you want to upgrade your single socket lights, convert a single bulb light to 4 bulbs light, this is the best choice It is E27 base, same fit as regular household bulb socket Application 1. For the bedroom, living room, conference room, kitchen, living room, hall, telephone booths, workshops and exhibitions, etc. 2. Architectural lighting, the communication lighting ,the city lighting,in the families and in the Public decorative lighting. 360 DEGREE ROTATABLE: Each socket has 360 rotating degree design, and the bending degree is 180. You can adjust the angle of the socket at your will.Easy to increased brightness with this 4 in 1 E26 E27 light splitter. SAFETY DESIGNED: This 4 in 1 adapter splitter is CE certified. Inflaming retarding PBT fireproof material and aluminium alloy, the heat resistant is up to 200 degree. 100% safe from electric flaming, no fire hazard. heat resistant is up to 200 degree. 100% safe from electric flaming, no fire hazard. WIDE APPLICATON: Ideal for any occasion .For bedroom, living room, kitchen, hallway, conference room, office and exhibitions, etc. 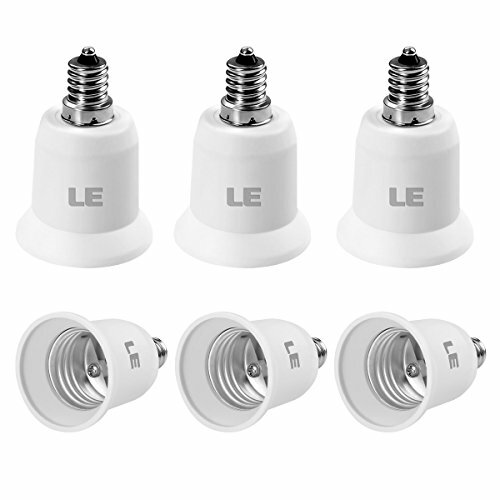 LE 3-Pack E12 to E26 LED Bulb Base Adapter Converter E12 to E26: This handy converter quickly and easily adapts any E26 Edison screw-in base lamp to an standard E12 base. 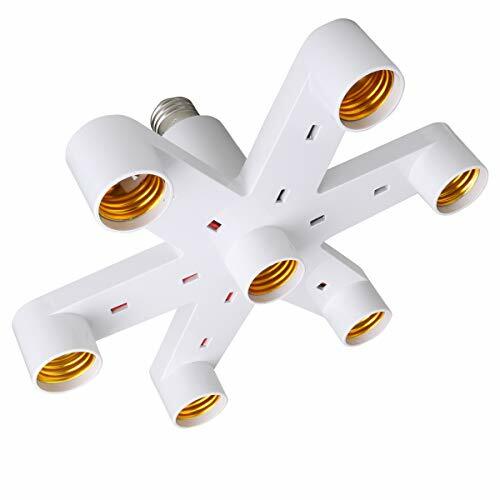 Simply screw an E26 base lamp in this converter, then install the concerter to any E12 standard socket.Ideal for the lights with candelabra sockets that need to be converted to a standard medium base. 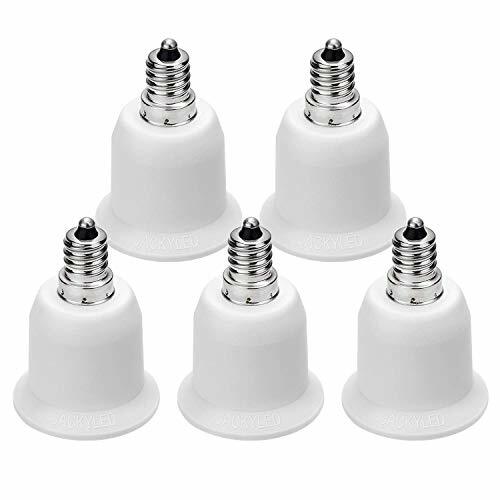 Pack of 6 Units Easy to install:Simply screw the socket adapter into E12 type socket, and then screw in an E26 bulb. Enlarge the light bulb socket: Enlarge the chandelier socket (E12) to medium socket (E26). Widely used: Works with incandescent, CFL (Energy Efficient) bulbs and LED bulbs. Dimensions: 2.30 x 1.55 inch (L x Dia) About LE Lighting EVER, abbreviated to LE,focuses on creating the best lighting experience. Only high end LED and advanced optical design are adopted. Enjoy lighting with LE. Easy to install. Simply screw the socket adapter into E12 type socket, and then screw in an E26 bulb. Enlarge the light bulb socket. Enlarge the chandelier socket (E12) to medium socket (E26). Widely used. Works with incandescent, CFL (Energy Efficient) bulbs and LED bulbs. Turn a medium/standard base socket into (2) 2-prong outlets and still be able to use the socket to hold light bulbs. Great for rooms with not many outlets. 125 watt, 660 volt max. Includes (2) white adapters. Simplify your life by remotely controlling lighting fixtures with a wall mountable remote controller. Each light bulb socket has a manual switch and can also be turned on/off manually. Strong radio frequency transmission can work through walls and doors to control lamp as far as 80' in the open area. Allow you to add extra handheld remotes, outlets and light sockets (Same model from Dewenwils only; contact us for more details). The socket adds approximately 2.28" in height or length. Not for use in totally-enclosed luminaires or humid environments. Thank you for stopping by to our most valuable JACKYLED Electrical Supplies! 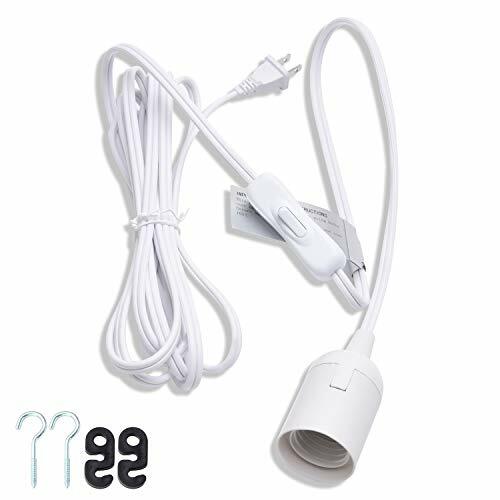 Buy now and get rid of your old extension light cords that doesn't work perfectly as you expected. We are proud to present our JACKYLED Lantern Cord Cable Extender with E26/E27 Socket for bulb lamp for the easiest and safest installation at home. 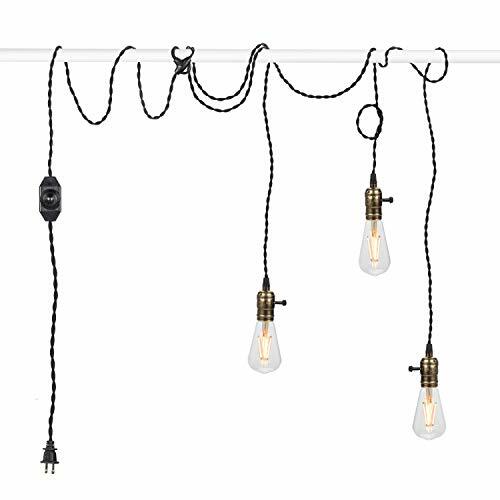 Our pendant lighting cords allow for full customization based on your needs and style. 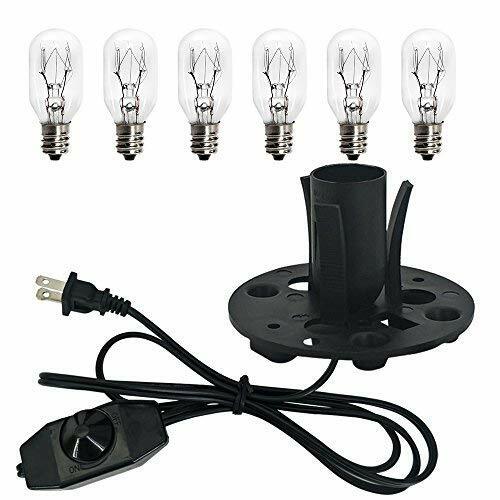 It's perfect for paper lanterns, lamps, mason jars, plant light, grow light and can be used also to brighten up any room or closet in the house, studio, shed, barn, attic, basement or any place to brighten up. A long cable cord with 3 available sizes just choose the length that fits your need, with 12, 15 or 19 feet long & a 2 ceiling hooks and 2 cords for a proper hanging without any accident in your home and safe for your little once. Quick & easy installation at home, this white cords is simple to install no need for some tools, just have to insert a bulb, plug it in and your light is working with the on & off control press. This cords can be used in every environment. They could be hung straight down from the ceiling, dangling from artwork or draped on any pole. It enhances every surroundings! Backed with the most durable reinforced material in the market that is made to be safe and last for a longer used, with heat resistant of 221 F / 105 C and UL certified. UL PRODUCT: The entire product is UL and CE certified. It's made of extra durable materials that will stand out for a long time. 100% safe from fire. 2-Prong US AC Power Plug. Works with any type of E26/E27 bulb perfectly. CONVENIENT USAGE: Lightweight and easy for anyone to use. We prepare 2 ceiling hooks and 2 cord hooks for hanging. It's simple to install the bulb without any tools. Control switch that you can turn on and off easily. BEST LIGHT FOR YOUR PLACE: Can be used anywhere you want, perfect for lighting up bedroom, living room, kitchen, studio, etc. Ideal for places that you are inconvenient to close to the power source. 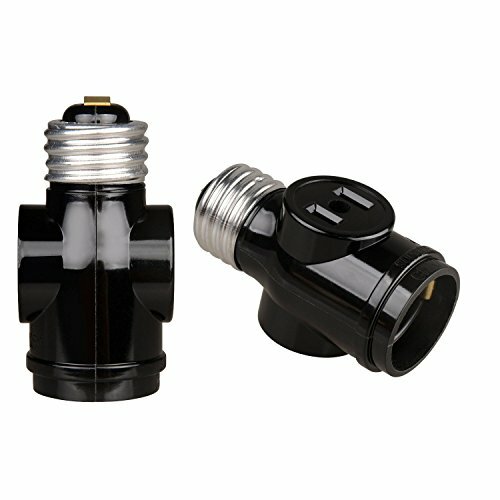 The 3-Way Lamp Socket can be used for lamp or fixture replacement. Use with 3-way light bulbs. Turn for low, medium or high settings. UL listed. Inner Material: Aluminium alloy, Copper. Functions: Fireproof. Anti-deforming. 200 Heat Resistant. E26 E27 Base. Upgrade 7 multiples light.  Applications: Used for the home, bedroom, living room, kitchen, office, conference room, workshop, exhibition, restaurant, hotel and other indoor lighting situations. 1 x 7 in 1 Paw Shaped Light Socket Adapter for E26/E27. 8T8 is a professional supplier which is focusing on the development and sale of Home Lighting and Office products. If you meet with any issue about our products after receiving the items, please feel free to contact us, we will try our best to solve your problems as soon as possible, letting you have a pleasant shopping experience from us on Amazon.com. Replace old or broken knob switches on your light fixtures with these two black finish replacement knobs. Their black finish and simple design easily match many common floor and table fixtures. These two knobs are tapped 4/36-F and come with 1/2-inch extensions that are tapped 4/36-M, allowing for versatility in installation and usage. 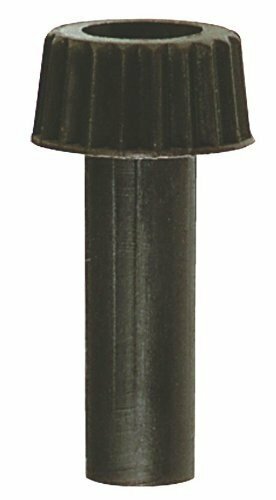 Set of two knobs Black finish matches fixtures Come with extensions. For switch knob replacement Carded. Dimensions 1/2" extensions. Installation Knobs are tapped 4/36-F Extensions are tapped 4/36-M.